All aboard the Titan Express! Sunshine is the latest corpse flower at the Chicago Botanic Garden to bloom. A member of the Aroid plant family (Araceae) from Sumatra, it has a number of titan arum relatives at the Garden from around the world. Jack-in-the-Pulpit (Arisaema triphyllum) and Skunk Cabbage (Symplocarpus foetidus) are the two most common Chicago natives in this family. Other relatives hail from continents, regions, countries, and islands. Taxa growing at the Garden have the following native ranges: North America, Northeastern United States and Canada, Japan, Korea, China, Thailand, Russian Far East, Kamchatka Island, Sakalin Island, the Philippines, Indonesia, Sumatra, Sri Lanka, Turkey, Greece, Republic of Georgia, Spain, Italy, India, Nepal, Afghanistan, Tibet, Burma, Himalayan Mountains, Yemen, Mexico, Central America, Panama, Guatemala, Caribbean Islands, South America, Colombia, Peru, South Africa, and Lesotho. Not only is it widespread, the members are also adapted to a number of environments from hot, humid Sumatra rain forests where Sunshine calls home to cold, temperate deciduous forests, temperate and tropical wetlands, Mediterranean climates, and deserts. 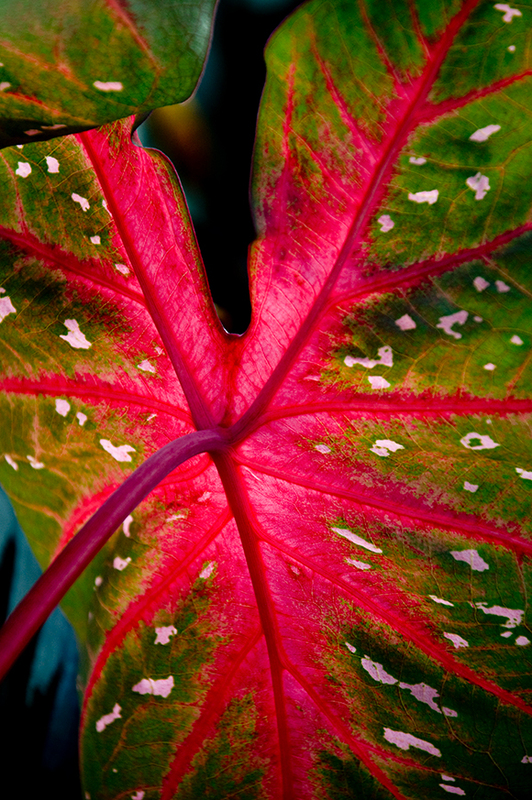 Find caladiums and others as you stroll Brazil in the Garden this summer; visit #CBGSunshine the titan arum outside in the Sensory Garden and stay tuned for a potential bloom! 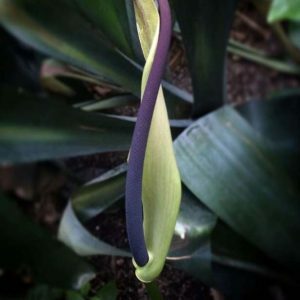 The Araceae is one of the larger plant families, containing 117 different genera. The Garden features 27 of those genera containing 152 species and cultivars. Our GardenGuide smartphone app features the locations where Sunshine’s family can be seen throughout the Garden. 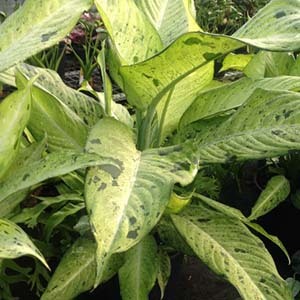 Many are grown ornamentally for their attractive leaf shape (philodendrons, anthuriums) and colorations (elephant ears, caladiums, dieffenbachia, pothos, taro) while others, anthuriums and Calla lilies chief among them, are grown for their attractive flowers. 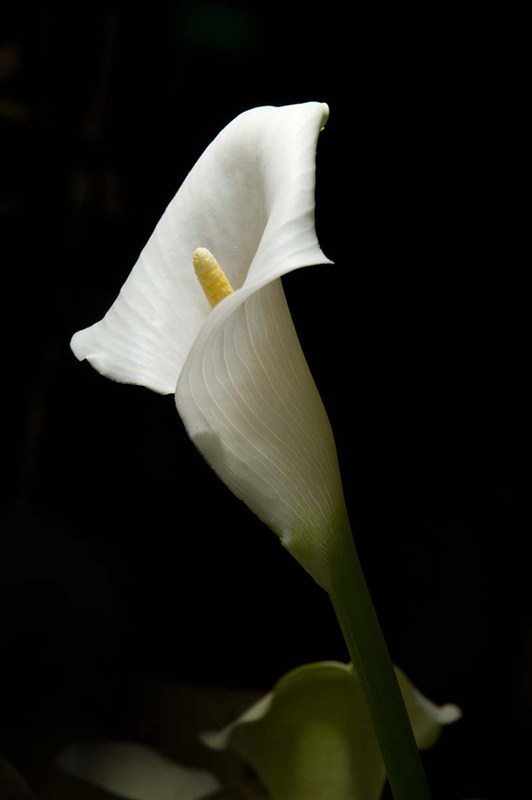 While not all members of the family smell bad—the Calla lily, for instance, has a light citrus fragrance and anthuriums don’t have any fragrance at all—many are real stinkers with common names like Dead Horse Arum, Dead Mouse Arum, and Corpse Flower. Most members of the family contain a number of compounds (often including calcium oxylate crystals) in their sap to deter herbivores that illicit a mechanical gag reflex in people. Calcium oxylate crystals look like glass shards on steroids under a microscope and play havoc with the soft tissues of the inside of the mouth, tongue, and throat. The most notable food crop in this family? Taro, or poi. Preparation of the starchy tubers have adapted techniques over the centuries that remove the toxic compounds. Ready for an Aroid treasure hunt? Find these titan arum relatives as you stroll the Tropical Greenhouse, where a titan arum leaf is also housed. Can you spot the family resemblance? 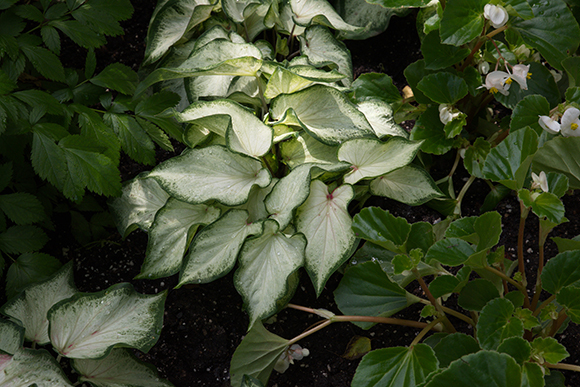 Flamingo flower (Anthurium andraeanum ‘White Heart’) is a classic anthurium flower of the florist trade in white with a red spadix; find it near the east entrance. 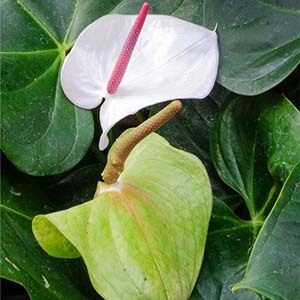 Find Garfield anthurium (Anthurium × garfieldii) in classical birds’ nest form with a long, thin flowering spathe and a spadix in dark maroon. Photo by horticulturist Wade Wheatley. 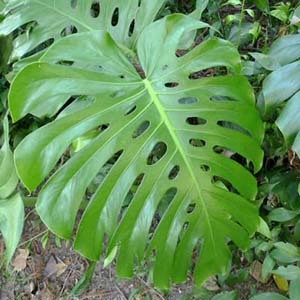 Split leaf philodendron or Swiss cheese plant (Monstera deliciosa) has a vining habit; it is clambering up the side of the greenhouse sporting large, deeply divided leaves. Its name says it all: Camouflage dumb cane (Dieffenbachia ‘Camouflage’) is hidden west of the palm alleé. 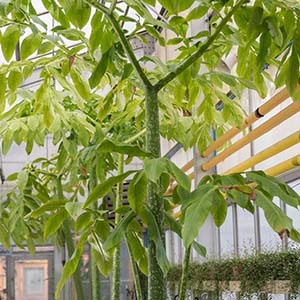 Amorphophallus titanum leaves in the production greenhouses. Find one in the Tropical Greenhouse, too. 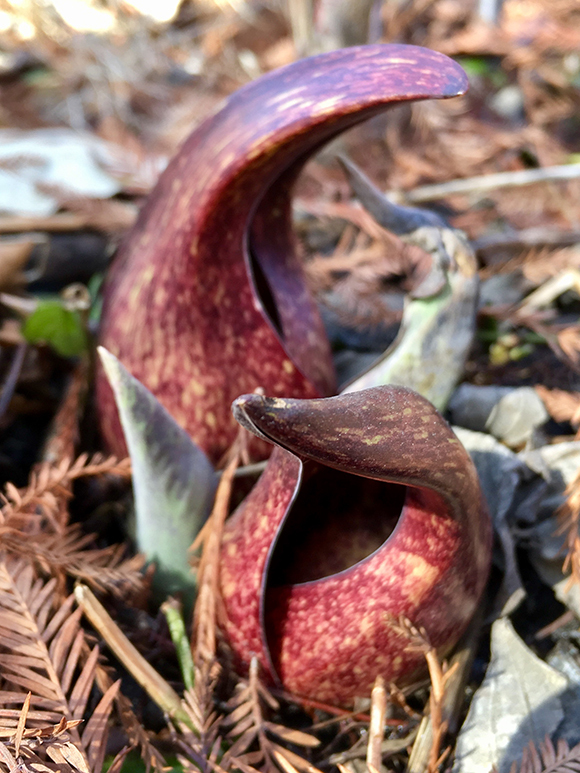 Titan Arum Seedlings Shared Throughout the U.S. 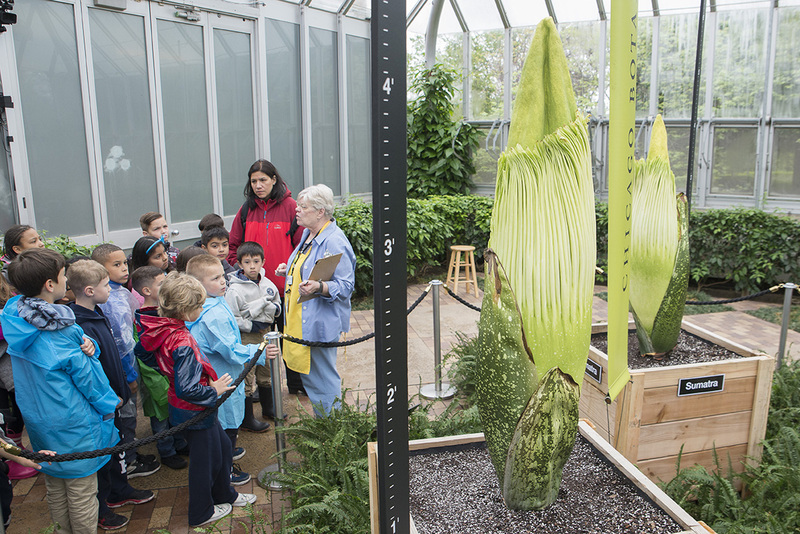 In the past year, more than 181 million people learned about Spike, Alice the Amorphophallus, and Sprout—the Chicago Botanic Garden’s titan arums (Amorphophallus titanum) that entered a bloom cycle—through various media sources. 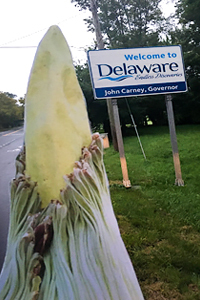 Now even more people may have the chance to learn about the unique corpse flower from seedlings sowed at the Garden that have been shared throughout the United States. 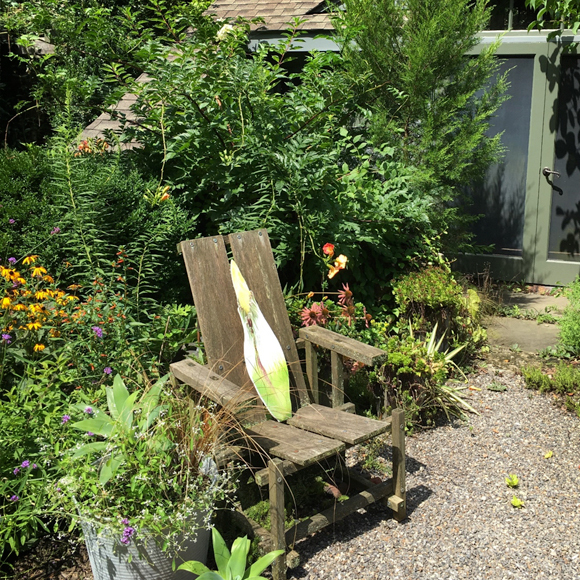 It all began about 12 years ago when the Garden procured titan arum bulbs and seeds, which we carefully cultivated until they were ready to flower. With the bloom cycles of Alice and Sprout, we wanted to try to pollinate our plants. 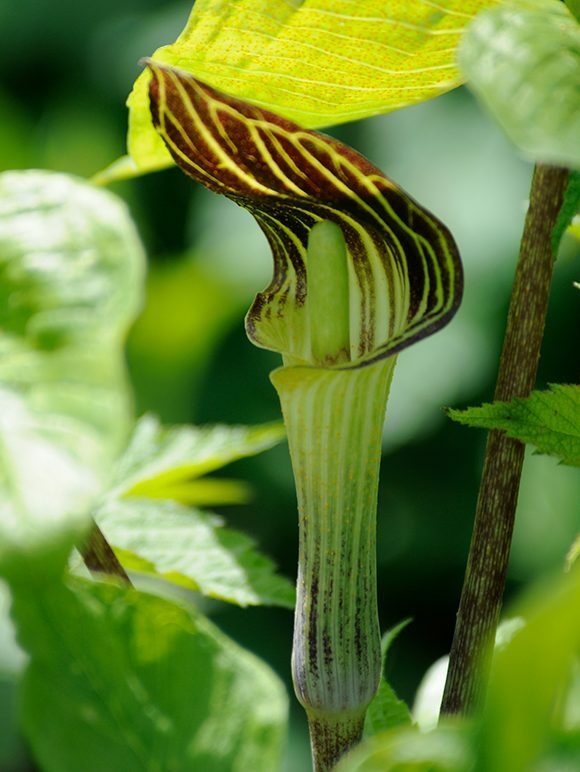 In nature, titan arums are pollinated by carrion beetles. Since such insects don’t exist at the Garden, we needed to do the work ourselves. As Spike, Alice, and Sprout are thought to be very closely related (with very similar genetic makeup), we speculated that fertilization with pollen from our first titan—Spike—to Alice would not occur: they were “self incompatible”—a term that often describes a plant species that is unable to be fertilized by its own pollen. So in addition to Spike’s pollen, we looked for genetically different pollen. 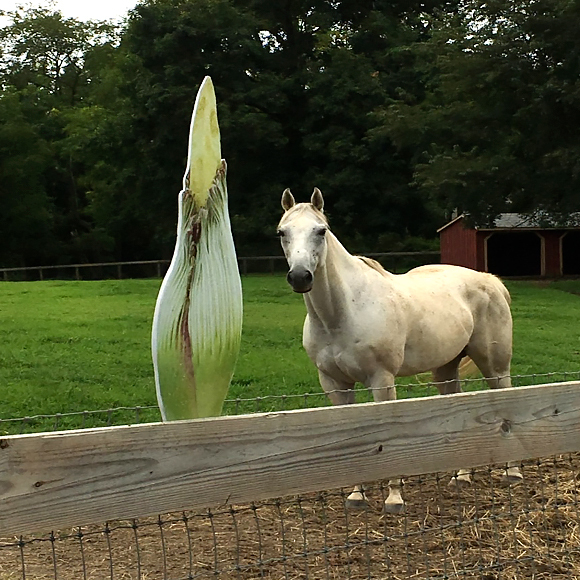 Fortunately, the Denver Botanic Gardens also had a titan arum (“Stinky”) in bloom last year, and they sent us some of Stinky’s pollen, which we used to pollinate Alice. After the pollination, Alice developed large, plump red fruits. These fruits were harvested and cleaned, and Deb Moore, part of the Garden’s plant production team, sowed the seeds. The result: about 40 quick-growing seedlings—each a single titan arum leaf. We decided to keep a few seedlings for our own uses, but we really wanted to share these young plants with the broader botanical community. 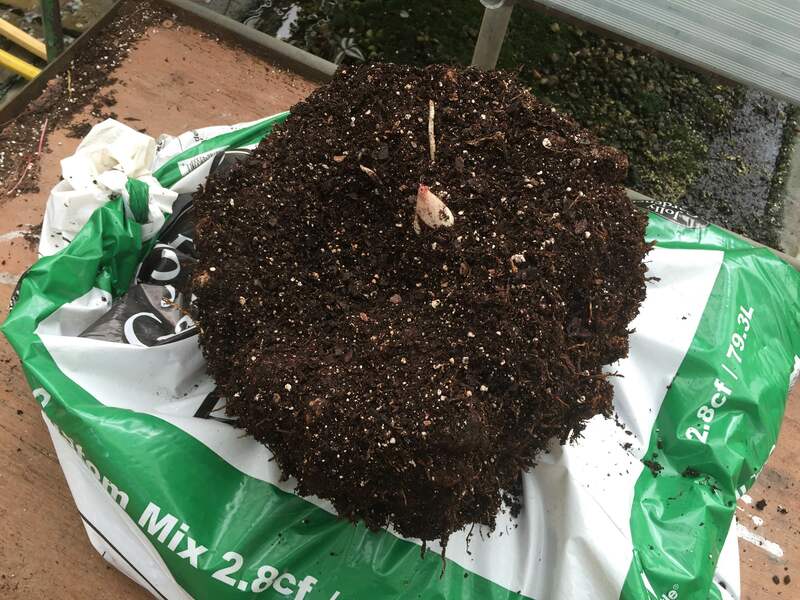 We contacted institutions in the American Public Gardens Association to see if any would be interested in acquiring an Amorphophallus titanum. #StinkyDBG is a dad! Rather than a stork, @fedex delivered the offspring from Stinky and @chicagobotanic's Alice. It will be planted and placed in the Orangery window next to Stinky. We had great response. Seedlings were sent to 27 institutions (see Google map above), including the Cincinnati Zoo and Botanical Garden; the JC Raulston Arboretum at North Carolina State University; the Botanic Garden of Smith College in Northampton, Massachusetts; Ganna Walska Lotusland in Santa Barbara, California; the University of Idaho Arboretum and Botanical Garden in Moscow, Idaho; Smithsonian Gardens in Washington, D.C.; University of California-Davis Department of Plant Biology; and of course, three seedlings went to the Denver Botanic Gardens to grow alongside Stinky. Posted on September 30, 2016 September 28, 2016 Author Andrew BuntingCategories Behind the Scenes, Horticulture & Display GardensTags #CBGAlice, #CBGSpike, #CBGSprout, amorphophallus titanum, corpse flower, corpse flower cultivation, titan arumLeave a comment on Titan Arum Seedlings Shared Throughout the U.S. 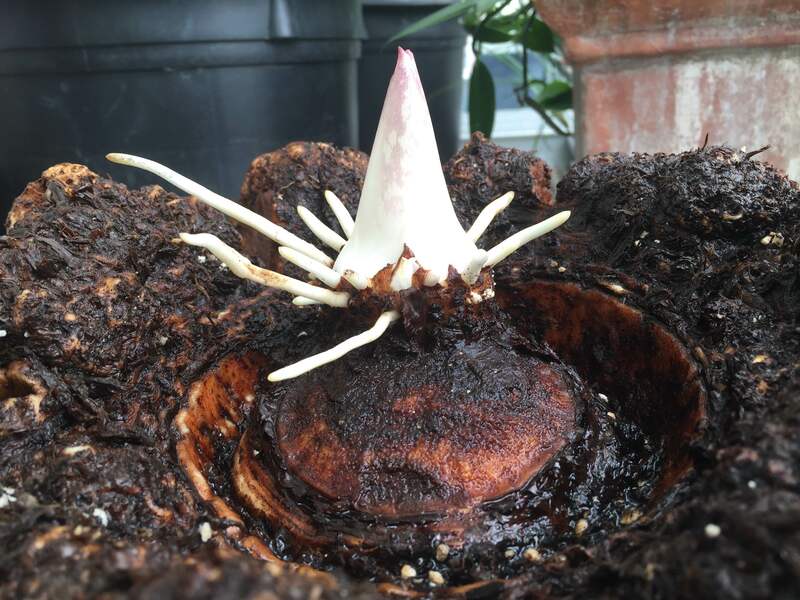 I have an update on Alice the Amorphophallus: Alice has been repotted and has a leaf sprout. Yes, Alice is alive and well, happily growing in the production greenhouses here at the Chicago Botanic Garden. Alice followed a normal growth cycle—as it would have in its native habitat on the island of Sumatra, Indonesia—producing fruit and seeds. This past summer, the flower stalk with the remaining fruit began to wither and collapse as Alice went into dormancy. (We successfully sowed and germinated the seeds, and were rewarded with several dozen seedlings.) On Tuesday, September 13, we removed Alice from the wooden crate she had been living in for the past 24 months, pleased to observe a healthy corm—and a new leaf shoot emerging from the top! We loosened the corm below the soil surface in order to repot it and record its current measurements, and got a few pretty interesting photos. 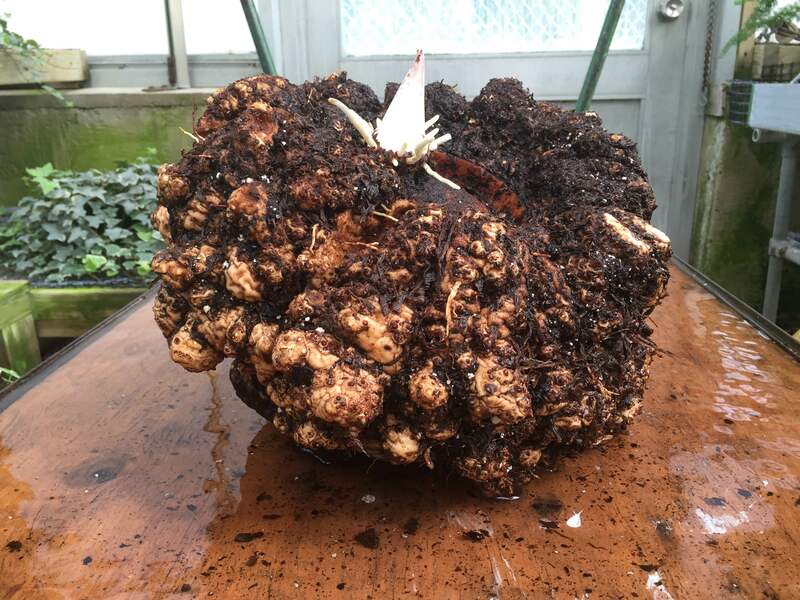 Here is Alice the Amorphophallus as removed from the crate, before washing. The freshly washed titan arum corm awaits weighing. One big observation was that the corm had actually decreased in size and weight. The big cracks seen in the images below are from the corm rapidly shrinking in size. This is from the large amount of energy (starch and sugars) used for Alice to bloom, and in the production of fruit and seeds. 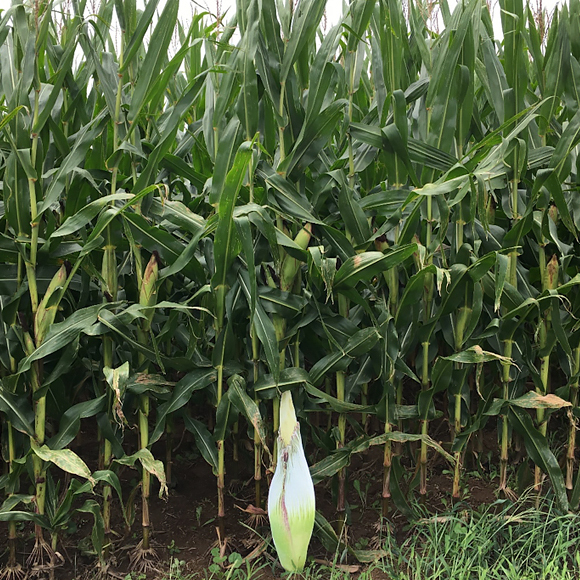 Rather than losing mass and becoming spongy, the post-bloom and fruiting corm is the same density, but smaller in size—both diameter and height—by several inches. Splits in the titan arum’s corm are from its rapid decrease in size as energy was used up. Now Alice is getting ready to begin the life cycle all over again as a leaf. 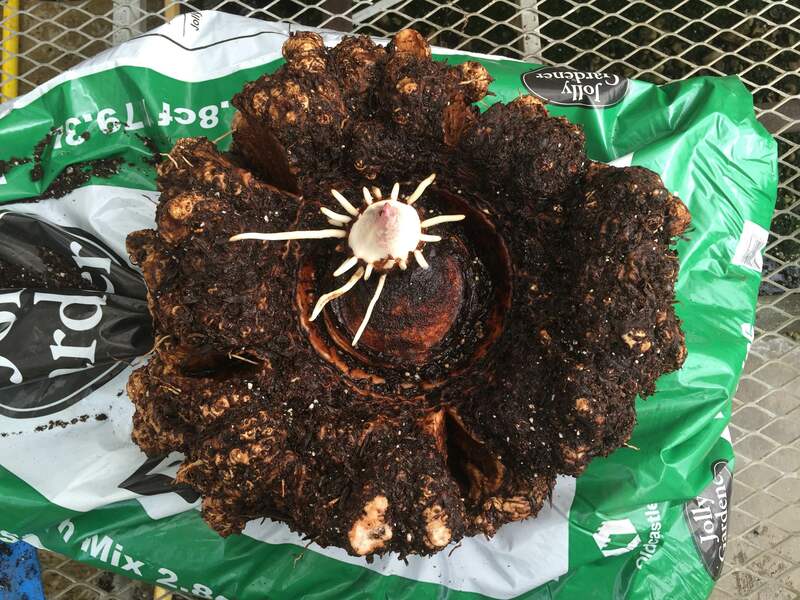 A ring of new roots at the top of the corm is to support the growth of the emerging leaf bud. The roots do not form or add to a new corm—new corms come from the main corm as bulblets on the side and bottom of the original corm. 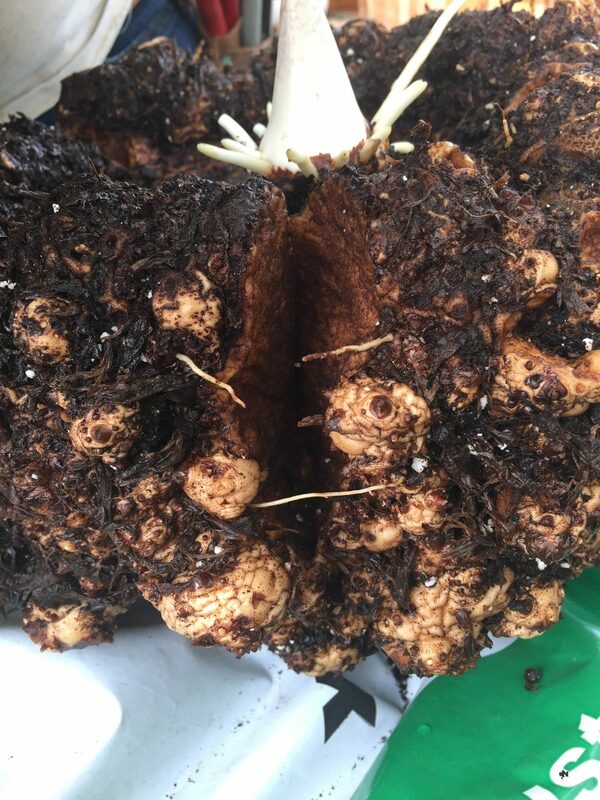 The corm has been repotted in a mixture of peat, coir (coconut fiber), composted bark, and perlite, back in its original crate, which still has room to grow in it. Alice the Amorphophallus gets ready to leaf out, almost exactly a year after blooming. I can’t believe it has been a year since we all gathered in the Semitropical Greenhouse at the Chicago Botanic Garden to celebrate Alice’s bloom and stink. What an event that was! Alice will bloom another day, maybe three to five years from now; we will just have to wait and see. 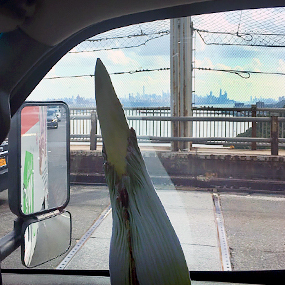 But in the meantime, it’s likely another one of the titan arums in our collection will bloom before then.